This four-volume, deluxe pocket boxed set contains J.R.R. 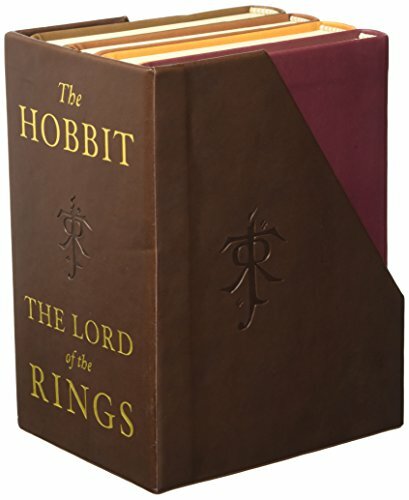 Tolkien's epic masterworks The Hobbit and the three volumes of The Lord of the Rings (The Fellowship of the Ring, The Two Towers, and The Return of the King). Each book features a leatherette cover with stamped title and all four books are held in a leatherette bound box with gold foil stamping. Shrinkwrapped. In The Hobbit, Bilbo Baggins is whisked away from his comfortable, unambitious life in Hobbiton by the wizard Gandalf and a company of dwarves. He finds himself caught up in a plot to raid the treasure hoard of Smaug the Magnificent, a large and very dangerous dragon. 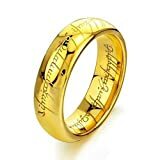 The Lord of the Rings tells of the great quest undertaken by Frodo Baggins and the Fellowship of the Ring: Gandalf the wizard; the hobbits Merry, Pippin, and Sam; Gimli the dwarf; Legolas the elf; Boromir of Gondor; and a tall, mysterious stranger called Strider. J.R.R. 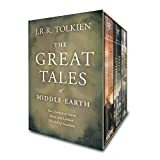 Tolkien's three volume masterpiece is at once a classic myth and a modern fairy tale—a story of high and heroic adventure set in the unforgettable landscape of Middle-earth. The story of the creation of the world that set the stage for The Hobbit and The Lord of the Rings.